Note: This character guide is for Season 1 in Shelby, NC. For season 2 characters, see the Deep Inside Mexico edition, our final season guide for season 3. 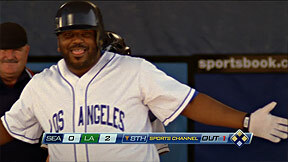 Mackworthy is Kenny Powers’ arch-nemesis who ended his baseball career with a grand slam, when he was pitching for the Seattle Mariners. Reg came back in town to work a promotion for the Ashley Schaeffer BMW dealership, where he and Kenny have their famous pitching contest that costs him an eye. ’ new boss at the middle school. He also happens to be engaged to April. After Kenny and April hook up, Cutler runs off into the woods to hide out and plot his revenge on Kenny with some chloroform and a pistol. 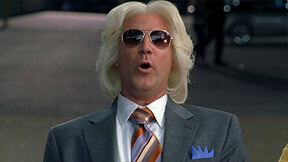 Ashley Schaeffer is the arrogant owner of the local car dealership, Ashley Schaeffer BMW. With the fine sport coats, long bleach-blonde hair, and “woooooo's” – he's a throw-back to professional wrestler Ric Flair. Kenny and Schaeffer no longer get along after Powers ruined a signing event at the dealership, and then threw a cinder block through a car window. And he also hits Kenny in the nuts alot. Schaeffer brings Reg Mackworthy back to the dealership for a signing event, and baits Kenny into a pitching contest with him. Clegg is one of Kenny’s old friends from high school who never left town. Now that Kenny is back in Shelby, they are partying buddies once again. He runs the bar in town called ShhBoom ShhBooms. 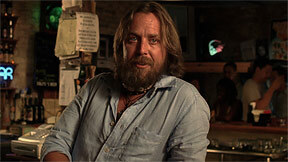 In his Atlanta press conference Kenny said he wanted to buy a bar. Is this the bar??? Clegg pours Kenny’s drinks, drives him around, scores him steroids, and other illegal substances. 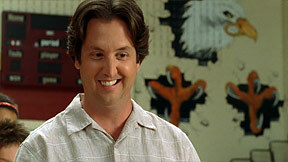 Stevie Janowski also went to high school with Kenny, but Kenny does not remember him. Stevie takes every opportunity to be around, or hang out with Kenny. Stevie is star-struck, and desperately wants to be Kenny Powers. Stevie helps Kenny out by taking DUIs for him, being his personal assistant, and filming and editing the Kenny Powers: Greatest Hits video to give major league baseball scouts. Check the episode guides for more classic moments with Stevie. April Buchanan is Kenny’s big-chested old flame from high school. She teaches art at the middle school, and is engaged to Principal Cutler. You kinda get the impression that Kenny left her behind on his first trip to the majors. With Kenny back, April tries to avoid him and play hard to get, but old feelings begin to surface. She secretly buys Kenny’s prized home run bat on eBay. After numerous advances from Kenny, she finally hooks up with him at her cookout, but that ends prematurely. 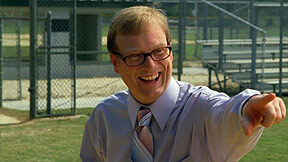 April also leaves Cutler's triathlon to watch Kenny’s showdown with Reg Mackworthy, where Kenny gets his pitch back. Dustin Powers is Kenny’s brother, who lives in town and owns a contracting business. Kenny moves back in with Dustin, his wife Cassie, and their kids. Cassie has a hard time adjusting to the abrasiveness of Kenny, but makes an effort to try to get along with him, and helps him out by auctioning his memorabilia on eBay. Dustin often mocks Kenny and his comeback aspirations, but talks him into accepting the challenge at Ashley Schaeffer BMW with Reg Mackworthy. Dustin and Cassie have three kids — Rose, Dustin Jr., and Wayne. Rose (not pictured) was named after the character in Cassie's favorite movie Titanic, making Kenny quip that one of the boys must be named named Shrek. Wayne gets yelled at for dry accelerating Kenny's precious jet ski in the driveway, and Kenny earns Dustin Jr's admiration for breaking the hated bird bath. 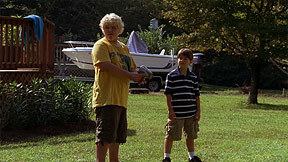 The boys can usually be found clocking Kenny’s fastballs with a JUGS radar gun. Tracy is another Shelby native who went to high school with Kenny. April remembers her when Kenny tries to pass her off as a famous model and painter from France at their cookout. She meets Kenny one night at ShhBoom ShhBooms, and comes on to to him since she recognized him from TV. Kenny worries about her bill of health, as well as his own, and recommends that she uses a dental dam from now on. When Kenny gives up baseball for life as a regular person, he ponders starting a family with Tracy.